BT have a Broadband Availability Checker, where you can find out which options your phone line will support. However, it’s not entirely accurate regarding future plans. When I checked that earlier in the year, it said that they’d install FTTC on 30th June. So, I waited patiently until 1st July to order this. I then checked the page again, and they said it was due on 30th September. However, someone from BT then phoned me in mid-July to say that it was now available; he mentioned this in the hope that I’d transfer my internet business to them (their “BT Infinity” service), which I wasn’t interested in, but it was useful information. The next step was to cancel my Zen account and get a MAC (Migration Access Code) which I could pass on to A&A. The theory here is that the ISPs will work together to transfer the service on a particular date, so there’s a minimal interruption in service. Sadly, it didn’t quite work out that way in practice. I initially went through Zen’s website. They don’t make it obvious, but you need to log into the customer portal, then go to “My Services”, “General”, and “Cancel a Service”. I followed their wizard, but I got stuck when it asked me for a cancellation date because the box was greyed out. It turns out that this is simply a badly designed user interface: they have a dialog box with a single question which you can’t answer, so you’re expected to just click “OK”. It would be far better not to show that dialog box at all, since they don’t need any information from me at that point. Anyway, since I got stuck on the website, I phoned them instead, and told them that I wanted to cancel my account. This brings up a more general issue: the exit interview. Whether an employee or a customer is leaving a company, it’s reasonable for that company to ask why. That way, they may learn something that will help them to retain other staff/customers. As a customer, I’m willing to help with that process, by giving honest answers. However, the company shouldn’t try to turn this into a negotiation by arguing about whether these are good reasons: ultimately, I have the right to cancel, and I don’t owe them any kind of explanation. Sky TV are a good example of what not to do: when I cancelled my TV package, I literally spent 25 minutes on the phone, while they kept offering me various discounts in an attempt to change my mind. That was sufficiently annoying that it’s put me off ever going back, because I know how difficult it will be to extricate myself from their clutches again. a) They could correct me if I’d made a mistake, e.g. if they do in fact support IPv6, or if they’re literally days away from releasing it. b) They could make a note of this in their records, so that they know it’s a problem, and start offering IPv6 to their other customers. c) They could decide that they’ll stay as they are, since the costs of implementing IPv6 (e.g. new equipment) outweigh the benefits (retaining a small minority of customers). I would be quite happy if they’d said anything like that. Instead, the guy I spoke to decided to argue the point, saying that it’s not a good reason to switch. He said that IPv6 isn’t important at the moment, because nobody else is using it. That’s not entirely true, since there are various websites which support IPv6 (e.g. Google); more importantly, I want to be an early adopter because I work in IT, so this will give me some useful experience before I need to deal with it at work. He then said that they’re planning to implement it, but they don’t want to rush into it before they’re ready; that’s perfectly reasonable, but it means I’ll go to someone else who is ready. Specifically, A&A have been offering IPv6 for nine years, so I’m confident that they know what they’re doing. He then said (paraphrasing from memory): “We’ve won awards for our quality of service. Are you sure you want to risk that by going elsewhere?” I simply said “Yes”, since I don’t appreciate that kind of attempt at intimidation. Anyway, I told him that I’d made my decision, and that I was only phoning him because of the problems with their website, so he backed down and gave me the MAC that I’d requested. 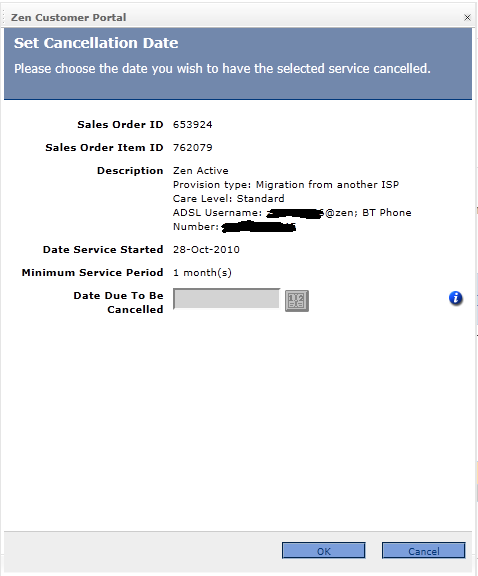 Tue 19th July: A&A emailed me the invoice for the migration (£100), and said that it would go live on Tue 2nd August. That suited me nicely, since I’d already booked the previous Friday and Monday off work, so I could have an extended weekend. They also sent me a direct message on Twitter, which said: “Your PROVIDE order […] has reached BT status PENDING/ISSUED”. This is a good way to contact customers: those messages come to my mobile phone (via SMS), and I get an email notification. Thu 21st July: A&A emailed me to suggest Tue 26th July. Fri 22nd July: I replied, saying that I couldn’t do that day. I also asked whether this would be the same day that the service went live or whether there would be a gap in between. They said that both things would happen the same day, and asked me to suggest an alternate date. I suggested Tue 2nd August. Tue 26th July: A BT engineer phoned me at about 8am, saying that he was on his way. I told him that I was about to leave for work, so it wasn’t convenient. (Normally I’d have let him in, but I had to get into work at a specific time that day to attend a meeting.) I emailed A&A to ask what had happened, since I didn’t want to get fined for the failed visit. Wed 27th July: A&A emailed me to say that “BT system were down on 25/07/2011 which caused BT engineer to attempt installation on 26/07/2011. A date has been tentatively appointed for the next available installation slot being 09/08/2011. Once installation is confirmed I will advise you.” That evening they sent me another DM on Twitter: “Your AMEND OF PROVIDE order […] has BT delay status Delayed New appointment required – CP issue”. Mon 1st August: I was at Disneyland Paris, queuing up for the Indiana Jones ride, when my mobile rang. It was a BT engineer, saying that he was outside my flat but nobody had answered the door. I told him that it wasn’t really convenient for me to go home and let him in. That evening, A&A sent me two more DMs on Twitter, the same as before: “Your AMEND OF PROVIDE order […] has BT delay status Delayed New appointment required – CP issue”. Tue 2nd August: I emailed A&A again, pointing out that I didn’t have any advance warning of BT’s visit. They replied and confirmed that the installation would take place on Tue 9th August. This was followed by another copy of the familiar DM: “Your AMEND OF PROVIDE order […] has BT delay status Delayed New appointment required – CP issue”. Tue 9th August: I booked the day off work, and the BT engineer turned up as agreed. He didn’t have to do any drilling, or install new wires, he just installed a new faceplate on my master socket and plugged in a new modem. (More info below.) I then tried to connect, but it didn’t work. At 10:30 I phoned A&A, and the person on the phone said that they were waiting for BT to “close” the case before they could activate my internet connection. At 12:30 I received the same DM as usual: “Your AMEND OF PROVIDE order […] has BT delay status Delayed New appointment required – CP issue”. However, this didn’t really make sense, since BT had now been and gone. At 15:55 I emailed A&A (using my mobile broadband) to ask for help. At 20:02 I got the same DM again (“BT delay status”). Wed 10th August: Someone from A&A phoned me, and said that BT wouldn’t close the case because there was still an outstanding order on it, due to finish on Mon 15th. He asked whether I have any other internet lines at that address, and I said that the only one was Zen, which I’d given them the MAC for. He confirmed that they knew about that one, and had liaised with Zen for a same day switchover. Thu 11th August: A&A sent me two more copies of the same DM (“BT delay status”). Fri 12th August: I emailed A&A again, since I’d now been waiting for three days. Nobody replied. Mon 15th August: A&A sent me another copy of the same DM (“BT delay status”). Tue 16th August: Zen emailed me to say that my service had been cancelled. A&A emailed me with an invoice and direct debit notice for my first bill (16th-31st August). I tried to log in when I got home from work, but it didn’t work. Wed 17th August: I phoned A&A, who clarified that I was using the wrong username/password. Once I used the correct info, I was able to connect. They followed this up with an email and a DM: “Your AMEND OF PROVIDE order […] has reached BT status COMPLETE”. Whew! So, what went wrong? BT kept turning up unexpectedly, and I never had any direct contact with them; A&A effectively subcontracted the work to them. In fairness to A&A, they can’t exactly shop around for alternatives, so if BT screw up then there’s not much they can do about it. On the other hand, that’s not really my problem: my contract is with A&A, not with BT. Similarly, Zen thought that they were cancelling my service a week later than they should have done. Presumably they won’t have been in touch with BT, so they’d rely on A&A to give them the correct date. That implies that either A&A gave Zen the wrong date or Zen ignored the information they were given. Once things started going wrong, it was difficult to get any useful information from A&A: they just kept sending me the same (automated?) Twitter message over and over again. I’ve had an A&A ADSL line set up in another organisation, and that all went off without a hitch. However, that was for a brand new phone line, and the line was already installed (with a dial tone) before I contacted them, so they didn’t need to liaise with anyone else. I don’t know whether the MAC transfer or the FTTC was more significant in this case. Also, if this had been a workplace installation then it wouldn’t have been a problem for BT to turn up early, since someone would have been around to let them in. At previous ISPs, my username has usually been derived from my phone number, e.g. the phone number by itself or 020xxxxxxxx@isp. So, I assumed that foo@a.1 was my password. Actually, that’s the username (very similar to the control page login), and I have the same password for the control page and for broadband. So, a small misunderstanding there, but it was easy to resolve; ideally I would have sorted that out on the same day the BT guy came, since I was around all day. One other issue to be aware of: if you install FTTC then there’s a minimum 12 month contract. The colours make it fairly obvious what’s changed! Basically, the bits that look manky used to be one complete unit. The BT guy unscrewed the bottom half of the faceplate, attached the new white bit (that’s a single S-shaped plate), then put the bottom half back on. That’s pretty simple, so I could have done it myself, and I expect that this will become “self install” eventually (once BT are confident that it all works properly). I used to have an ADSL microfilter plugged into the master socket, which split the signal into voice and data; I now have two separate sockets. The modem is new, and I have no control over that at all. Essentially, that’s the BT endpoint on my premises. 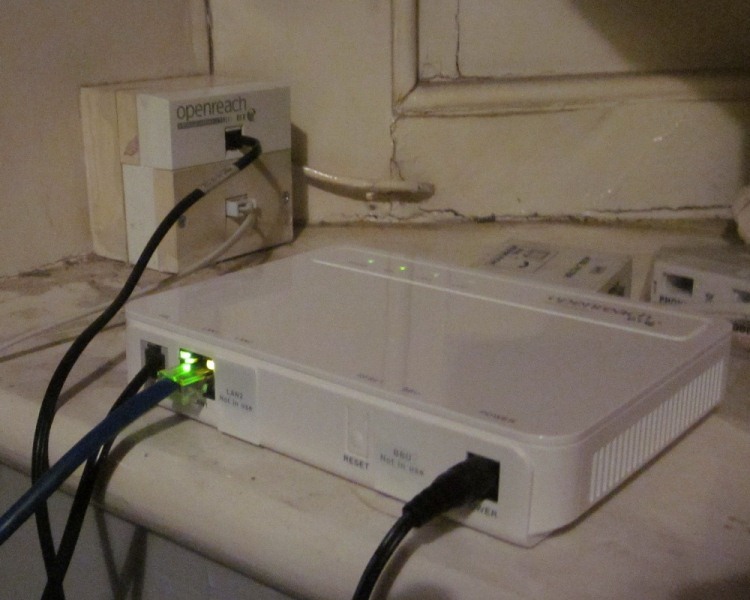 I have my wireless router (a Linksys WRT320N) plugged into that in PPPoE mode, i.e. I store the username/password in my wireless router rather than in the BT modem. At the moment it’s all IPv4, because the Linksys firmware doesn’t support IPv6. However, my next step is to replace that firmware with dd-wrt, which does support IPv6. I’ve delayed that because I wanted to make one change at a time: that way, if anything stopped working then I’d know what caused it. I’ll do a separate post about that later. Ah well, at least I’ve gained some useful knowledge from this experience, which was the purpose of the exercise.